Nothing says back to school like a new crisp white shirt - and even though my educational years are far behind me, I still like to get those "new term" essentials when the air turns crisp. The other day I found my first conker and had the obligatory Pumpkin Spice latte to officially welcome autumn. 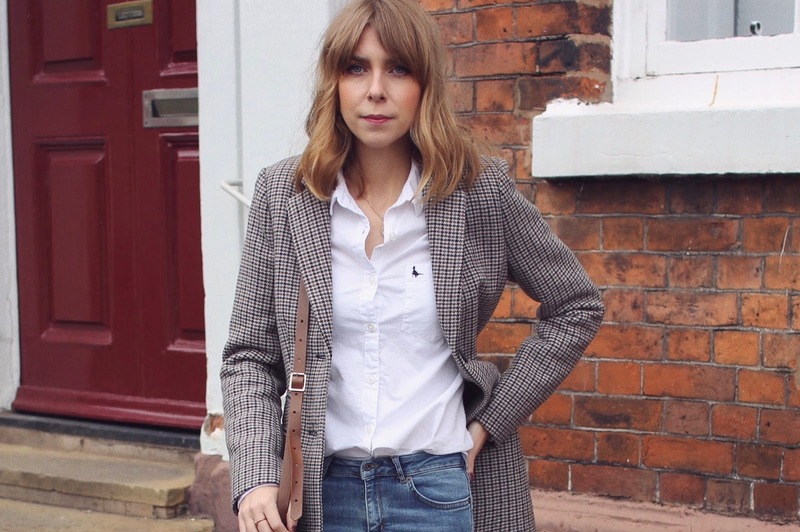 The Oxford shirt is a quintessentially British wardrobe staple, perfect for office-wear or off-duty at weekends, tucked into a pair of jeans (or denim a-line mini skirt for a more Jane Birkin look). The possibilities are endless. And speaking of jeans, I've had a love-hate relationship with skinny jeans for most of my twenties. However, my quest for the perfect fit and colour has come to an end. The Fernham jeans are mid-rise so they sit just above the hip and narrows to the ankle, so very flattering indeed. The Chelsea Overcoat. AKA, my coat of dreams. Inspired by traditional wool overcoats invented for the boys of the 18th century (because who's style icon isn't Ludvig van Beethoven? ), this checked overcoat looks seriously dapper, but can easily be dressed down with a pair of jeans and mary-janes. View the AW18 collection here. That coat!! I love it! This is such a great classic fall look.